The U.S. Olympic team includes more than 75 athletes from the northwest. One of them is Minnesota transplant Ben Blankenship, who be will be competing in the men’s 15-hundred meter race later this month. 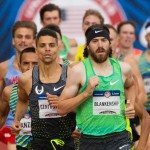 He’s excited about Rio, and has been preparing by training in some uniquely northwest locations.